Definition at line 531 of file shellclasses.h. Definition at line 533 of file shellclasses.h. Definition at line 136 of file shellclasses.cpp. Definition at line 128 of file shellclasses.cpp. Definition at line 542 of file shellclasses.h. Definition at line 548 of file shellclasses.h. 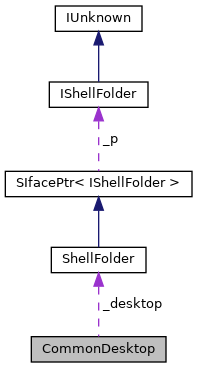 Referenced by CommonDesktop(), init(), operator ShellFolder &(), and ~CommonDesktop().